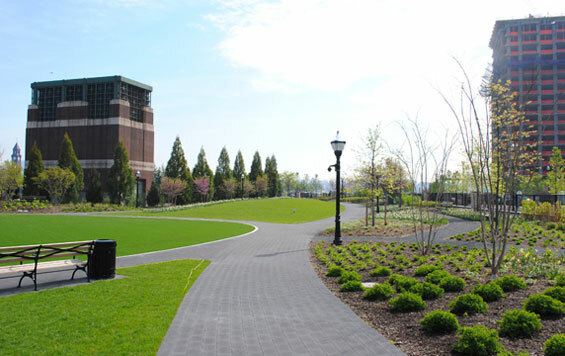 Newport Green, a park comprising a 4.25-acre waterfront site at the north end of Newport, New Jersey, is now open to the public. 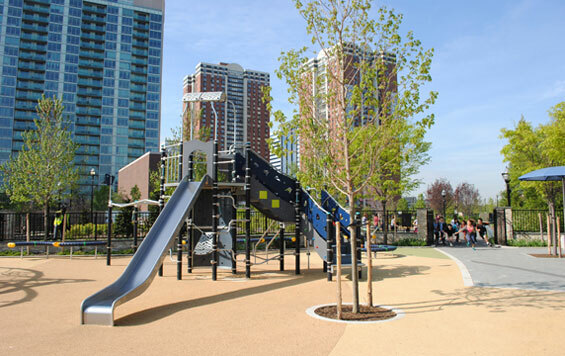 Located in a large, mixed use community across from lower Manhattan, the park provides comprehensive amenities requested by local residents not available in other area spaces. 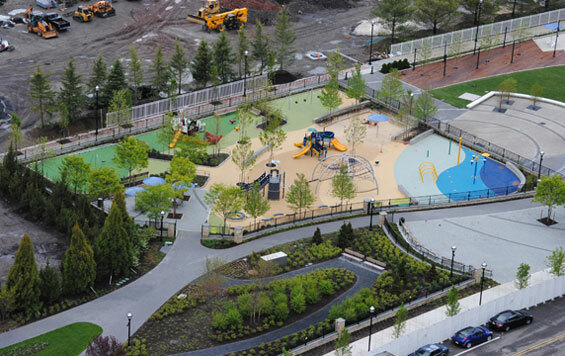 The first phase of the park, comprising an all-weather play field, playground, display and native gardens. 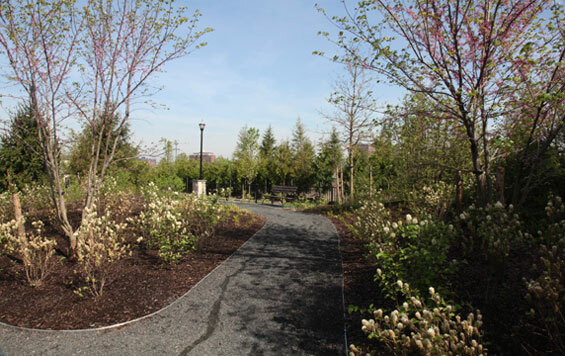 Mathews Nielsen Landscape Architects, lead a multi-disciplinary team to design the park with The Newport Associated Development Company oversaw the development of Newport Green, which incorporates active and passive spaces, with multi-purpose spaces interspersed between them. Sweeping walkways intersecting sitting areas guide the visitor through the park’s key areas: field and garden, play, plaza, and urban beach venues. 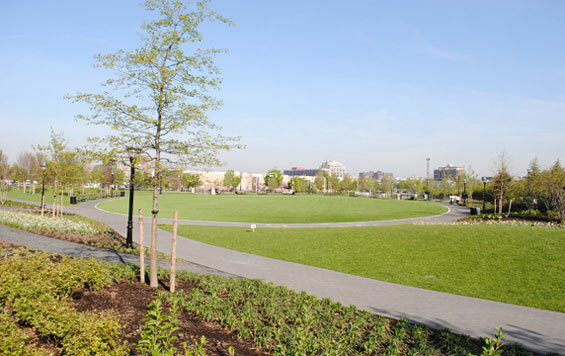 A large, all-weather, multi-purpose field and adjacent lawn areas, peripherally framed by a bird and butterfly habitat and native planting display gardens, are available for passive use, seasonal concerts, or pick-up games. 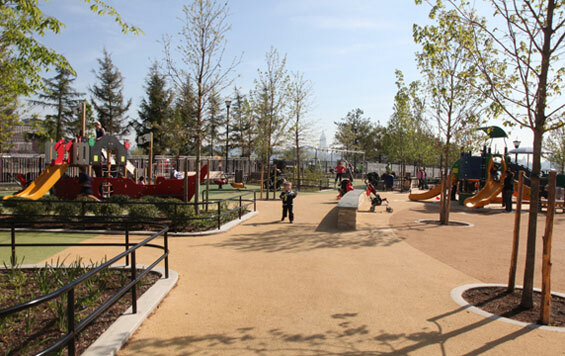 The park’s dynamic playground is imbued with a coastal atmosphere and provides activities for all ages. A carousel, a ping pong table, and a climbing dome highlight the area. Nearby, the Overlook Plaza has an interactive water feature that can be turned off to provide space for a farmers market or other public gatherings. 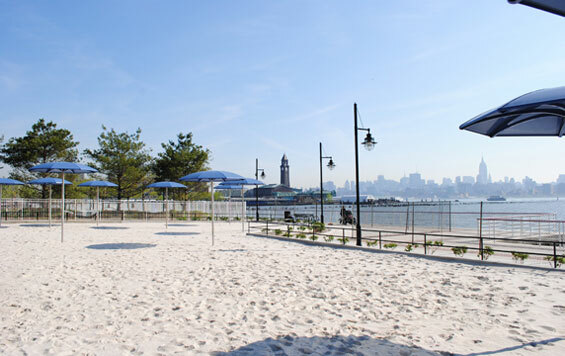 The urban beach is surrounded by large wood decks perched above the Hudson River Waterfront Walkway—a 40 mile waterfront corridor extending from Fort Lee to Bayonne—that are fitted with colorful permanent umbrellas and Adirondack chairs. The park’s dramatic lighting design transforms it into an inviting experience in the evening, accentuating its architectural and other special features. 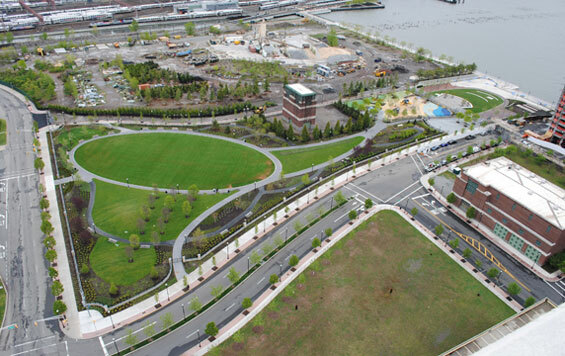 A key challenge during the project was designing around the existing PATH (Port Authority Trans-Hudson) vent building and tunnels as well as major utility lines that run directly under the site. Landform and site elements were sensitively placed to protect and screen these vital components.